While I could give you a list of places to find outstanding cookies, and some very good cupcakes, I am not aware of any really awesome local options for pie. Please, someone, anyone, enlighten me if I’m missing out. (If coconut is mentioned in your response you will be automatically disqualified, so answer carefully.) So this means I was craving pie, with no pie to be had. Clearly, the only logical solution was….make one. Woo hoo, spontaneous pie! I don’t always have a well-stocked pantry in terms of throwing together a meal, but when baking is the name of the game I usually have the basics, and today was no exception. A quick Google search for some simple options led me to a butterscotch recipe and the only thing I needed was milk, which I was already planning on picking up on my way home from lunch out. Perfecto. And as long as I had to get milk, I also got a half-pint of whipping cream to top it off. The recipe origin is Paula Deen, and she annoys the crap out of me, but she’s less irritating on paper than she is on tv. And it didn’t call for lard, so I was willing to give it a go. It called for a pastry shell, however, and I prefer graham crackers crusts both to eat (with the appropriate filling) and to make, so I modified. 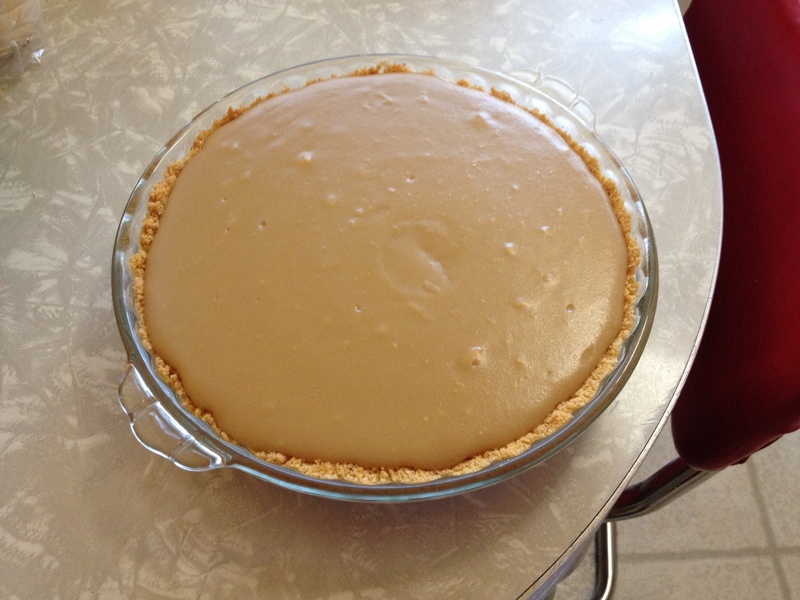 It was also the only way it was sneaking into my day – no time for full-blown pie crust. Graham cracker crusts are super easy. It can be fun to smash the hell out of the crackers, but today I had a container of crumbs on hand from some prior baking adventure. Mix everything together. Press mixture into an 8 or 9 inch pie plate. 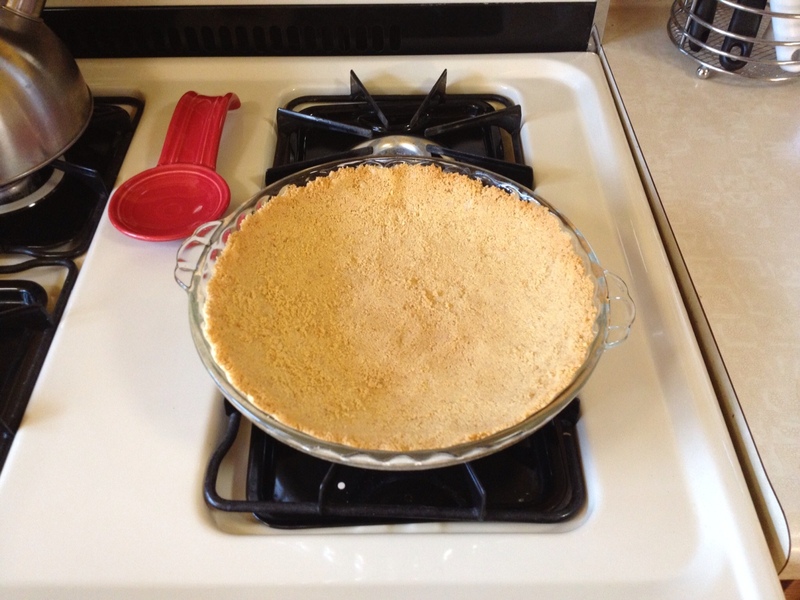 I read a little trick today to use the back of a spoon to press the crumbs into the pie plate, and that worked nicely. Bake at 375 degrees for 7 minutes. Cool. Paula mixes butterscotch chips into her whipped cream, and sprinkles more on top. That seemed unnecessary to me (although I did have some in the pantry) so I ignored that part. In a large saucepan combine sugar, flour, cornstarch and salt. Slowly stir in milk. Cook over medium heat, stirring constantly until it thickens. This is boring, and it takes a while. But keep stirring, otherwise it might get lumpy or scorch on the bottom. Be patient, this is what makes your pie luscious. I would suggest that you download Ruzzle onto your phone and challenge me to a game while you’re stirring, but I found it hard to focus on the game and maintain good stirring motion. 😉 It took maybe 10-15 minutes for it to thicken. And you will just know – oh, look, it’s thickening! When it happens, it happens quickly. I turned the heat very low at this point so I didn’t have to worry about neglecting it for the next minute or two. In a separate bowl temper your 2 egg yolks by whisking in a small amount (a few spoons full) of the hot mixture. Stir in the eggs, butter and vanilla, and allow to cook over low heat for a few minutes. At this point, Paula recommends pouring into a dish and cooling in the fridge. My crust had cooled, so I poured the filling straight into the pie plate. The whole thing is in the fridge now, chillin’ like a villain. Um yeah….I’m gonna need to go eat some of that now….the verdict is in….yum! That sure is a purdy pie you got there. Omg and of course I have tons. You guys should come over for dessert tomorrow!